Sanitary Doily pays tribute to a traditional handmade use-object's chief function: to conceal and pretty-up unsightly evidence of everyday life. The design borrows from actual patterns, with the swirling core used here to convey a flushing toilet action. The surrounding negative spaces are reshaped as random water droplets while just managing to maintain pattern integrity. 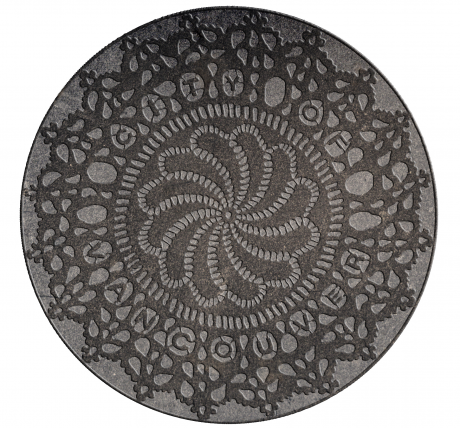 Sanitary Doily is intended to be whimsically informative, enhanced by the prominent inclusion of the City of Vancouver into the lacework. It is conceived as an imperfect, pleasing intervention in a manufactured landscape.